Most Minnesotans would expect there to be two feet of snow by the turn of the new year, but this year has been a surprisingly brown winter. As Leah and Matt planned there winter wedding, I know somewhere deep down, they were hoping for snow… and the morning of their wedding, there was a beautiful snowfall that covered the ground in white! What a beautiful backdrop for their big day. This was a fun wedding to create a cake for because the decorations and flowers were surrounding the woodland theme with golds, red berries, and lots of fresh evergreen scents in the air! Their cake was a chocolate cake with raspberry filing and fresh vanilla almond buttercream. 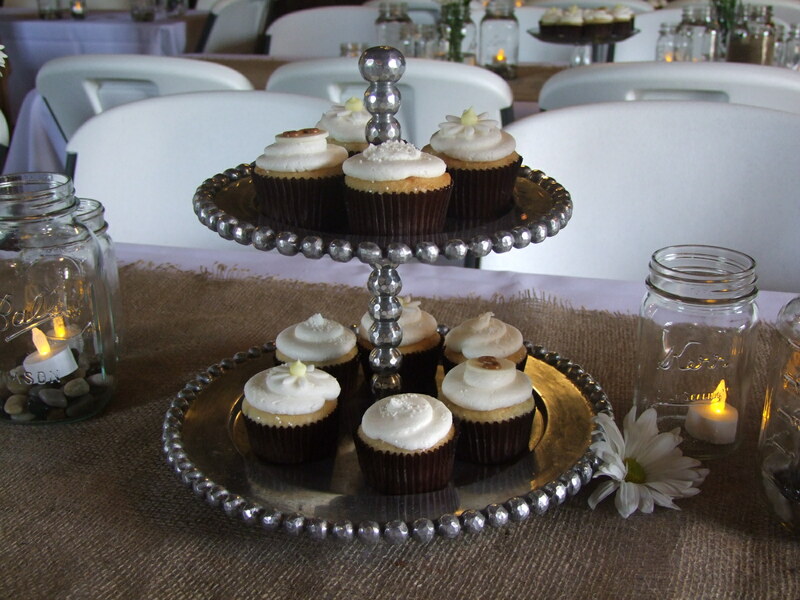 The cupcakes that fed the guests were vanilla cake with bavarian cream filling, chocolate cake with bavarian cream filling and carrot cake with cream cheese buttercream. 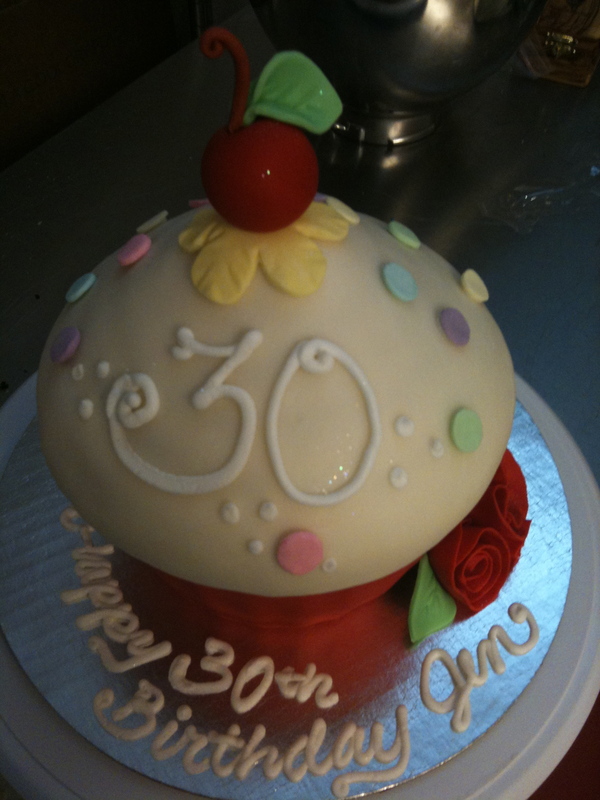 They were decorated with a handmade chocolate twig and fondant berry. 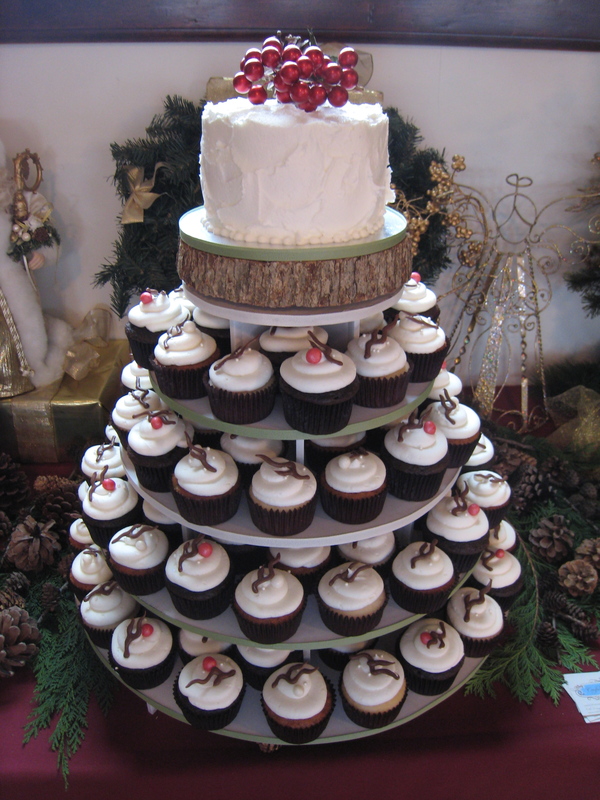 The cupcakes were displayed in a custom cupcake stand that the couple got to keep. The Vintage Ballroom in Faribault was a beautiful venue that was the perfect place to celebrate their winter wedding. Congratulations to the lovely couple, Leah and Matt! October is Breast Cancer Awareness Month and Confectionery Cake Shop is ready to bake over 1,200 cupcakes for the cure, but only with YOUR help! 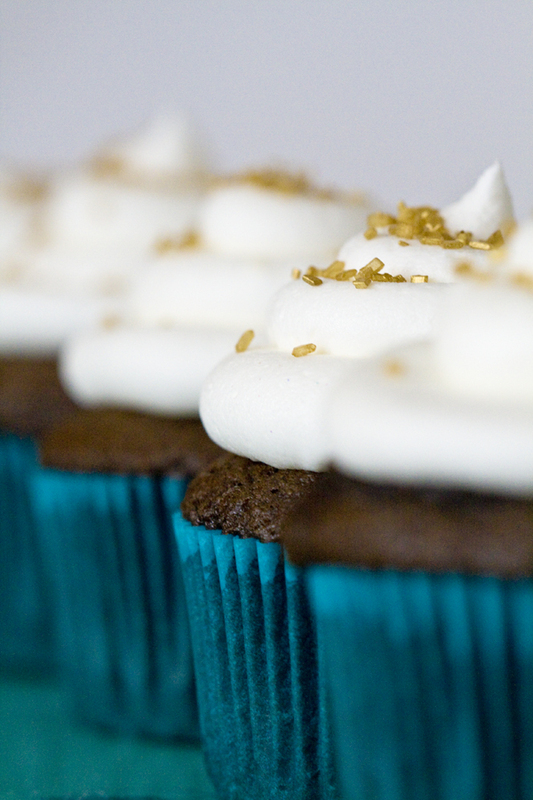 Starting today, you can pre-order special cupcakes for delivery on October 1st – October 31st. Place an order for a dozen “Cupcakes for the Cure” and you’ll be participating in in the Susan G Komen Passionately Pink Program, partnered with ACH Bake For The Cure to support breast cancer research. For each order placed, 50% will go toward the cure (that’s $10 per dozen!). The first 100 customers to order 2 dozen or more cupcakes will receive a very special donor pin as a free gift! This is a great way to support the cause and treat your clients, co-workers, family and friends to a cupcake as a way to remind them to get checked or to help honor and remember a loved one! 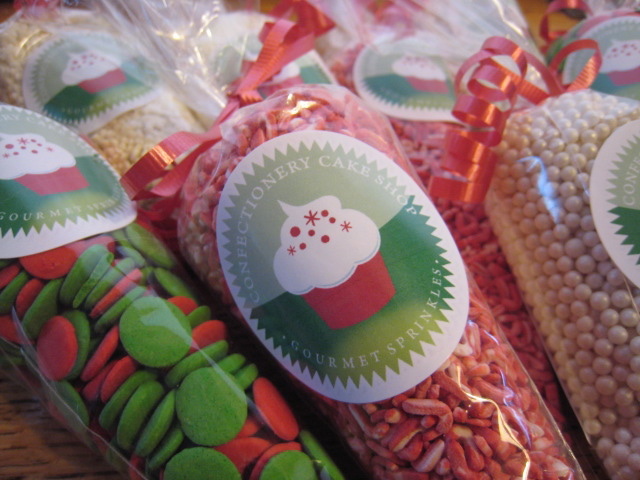 Each order is delivered to your home or office between 10am-2pm M-F or you have the option to pick your order up from Sweet Spot Candies in Faribault during their regular business hours. Check the team site often to see how close we are getting to our $1000.00 goal! There are a few ways to participate. 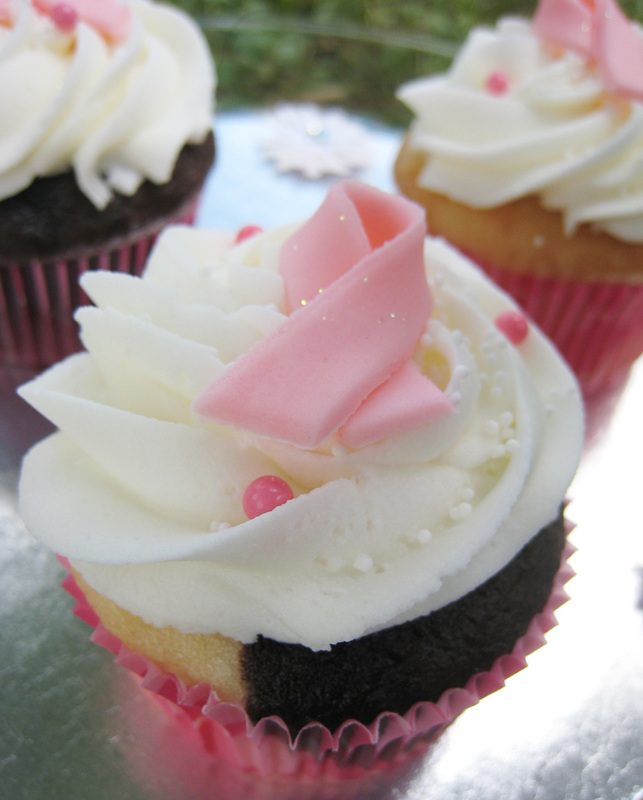 One way is to order white, chocolate or marble cupcakes with the pink bow on them by emailing confectionerycakes@gmail.com and put ‘Cupcakes for the Cure” in the subject title (please see delivery and order info under the Menu & Pricing tab above – orders are limited to the Minneapolis/St. Paul metro area within 60 miles of Faribault, MN). You can also call in the order to 507-384-9008, stop into Sweet Spot Candies and fill out a special form or I will also be stopping into local businesses in Faribault where you may place your order then! Not in the mood for a cupcake, but still want to give? Feel free to go directly to the Team website and donate any gift amount. It’s that simple – You ORDER, We GIVE. A Rewards Program that Pays out in CUPCAKES!! Introducing the Confectionery Cake Shop Cupcake Cravers Club, the punch card that rewards you with buttercream and sprinkles! 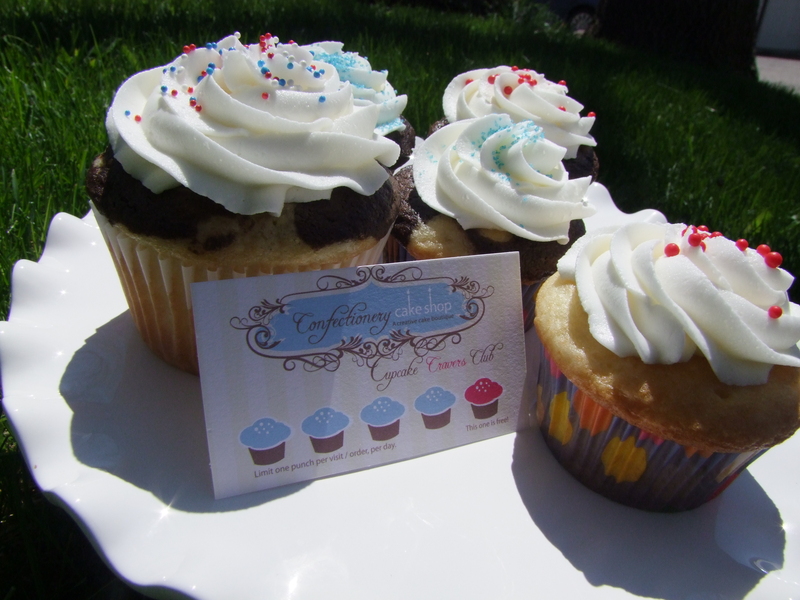 The next time you purchase a cupcake, make sure to grab one of these cards and keep it in your wallet. Make another purchase, receive another punch. Once you’ve made four purchases, you get to pick out any cupcakes in the case at the Sweet Spot and take it home for FREE! (I personally would use this for a filled cupcake or a jumbo one if you haven’t tried those yet.) This is just our way of saying Thank You and… enjoy! *One punch per visit or order, per day.